It’s a sunny August morning in Minneapolis, and deep in a Theodore Wirth Park meadow, Erin Rupp ’04 is leading the search for a missing queen. After several unsuccessful leads amid mounting uncertainty, her group spots the queen. “There she is—you found her! She’s huge!” Rupp says. The five students in her class are equally excited. “That’s so wonderful,” says one, her relief palpable. When a beekeeper like Rupp goes into a honeybee hive, tracking down the all-important queen bee is always a priority. 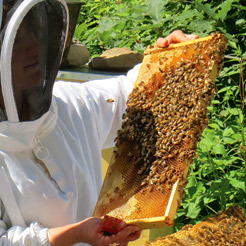 “We check our hives every 7 to 10 days to make sure the queen is still alive,” she says. 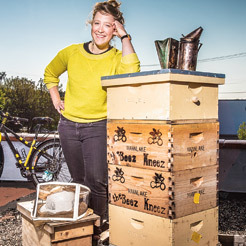 The Wirth Park location is part of the network of eight host sites and 45 hives that Rupp helps maintain through her work at The Beez Kneez, a Minneapolis-based business that provides honey and honeybee delivery, production, and education. A self-described “informal science teacher,” Rupp is a firm believer in experiential education: the more people she can persuade to put on beekeeper suits, the better she’s doing her job. She developed that philosophy while studying geology and environmental studies at Macalester, and today it defines her work at The Beez Kneez, which she runs with partner (and Beez Kneez founder) Kristy Allen. For Rupp, hands-on learning—watching the bees at work inside their hives—is the best way for students to understand both the intricate structure of how bees live and the significance of their role in our food system. As most people know, that role is now in peril. Honeybees pollinate a third of everything we eat, and while much of our food system has been mechanized, machines can’t replace bees. Commercial agriculture farming practices mean the number of North American acres needing pollination is at an all-time high, yet the number of hives has declined significantly. Large fields of homogenous crops make it impossible for bees to pollinate one location year-round, leading commercial beekeepers to move hives around the country from crop to crop. With hives thus concentrated, diseases spread more easily among bees often already weakened by pesticides. Hence Beez Kneez’ mission: to revive the hive. Rupp and Allen met and honed their mutual passion for beekeeping at western Wisconsin’s Foxtail Farm, though so far their own work has been centered in Minneapolis. It’s a surprisingly rich environment for bees, Rupp explains, because the city’s many gardens, flowers, and urban green spaces provide a diverse habitat in which bees can flourish. Awareness is best raised through inquiry education or teaching through doing, says Rupp. 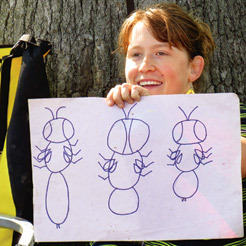 Through Community Bees on Bikes, the educational component of Beez Kneez, Rupp teaches students of all ages. (“Anyone over age five can put on a bee suit,” she says.) With each class she goes over the basics before heading into a hive, so the group is ready to recognize a drone from a queen or a worker bee. Along with teaching, Beez Kneez also opened a honey house in Minneapolis this summer, funded by a Kickstarter campaign that raised nearly $40,000. Beez Kneez’ honey sales—all delivered by bicycle— support its programming and host sites, so owning a honey house will allow the organization to boost its production and expand its reach. They’ll also rent out extracting equipment to hobby beekeepers. Given the many projects in store for Bees Kneez, it’s no surprise that Rupp recently decided to leave her day job teaching at the University of Minnesota’s Bell Museum of Natural History to focus full time on her new enterprise. It’s a leap, but during the transition there’s one certainty: The nearly four dozen hives—with 50,000 bees—will keep her busy. Each hive produces roughly 120 pounds of honey per season, so in the summer Rupp has her hands full teaching classes and maintaining hives. During the winter and spring she develops and advertises classes, fulfills honey orders, applies for grants, and maintains the organization’s yellow and black bike fleet. REBECCA DEJARLAIS ORTIZ ’06 is a staff writer for Macalester Today.